Comments: The Wookiees are intelligent, fiercely loyal and exceedingly strong. When their peaceful planet of Kashyyyk is enveloped by the Clone Wars, these ferocious warriors fight the Separatist incursion. 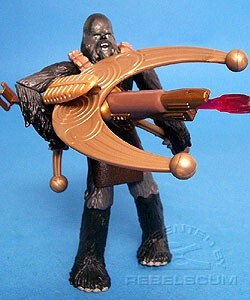 Wookiee Commando is a repaint of Wookiee Warrior III-43, but this he's armed with different accessories (the Firing Cannon from Yoda III-03) and a new loincloth.